Graphic but mystical, vibrant yet enigmatic, the work of American artist Eyvind Earle is a treasure trove of subtle and shimmering contradictions. 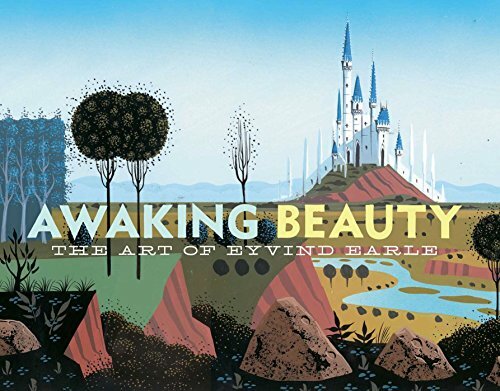 From fanciful backgrounds for Disney classics such as Sleeping Beauty to bold experiments in multimedia art, from ambitious commercial animations to lush and otherworldly oil landscapes, Earle's oeuvre never fails to please the eye and engage the imagination. And here, collected in Awaking Beauty—the official catalog for the 2017 Walt Disney Family Museum exhibition of the same name—is a definitive exploration of his life's full work. Born in New York City in 1916, Earle showed early talent, hosting his first solo exhibition at the age of fourteen. After traveling in Mexico and Europe as a teenager, he bicycled across the United States, painting watercolors to pay his way. In the late 1930s, he began designing Christmas cards—which have sold more than 300 million copies over the years—while continuing to exhibit his fine art. Earle's transformative moment, however, came in 1951, when he was hired at The Walt Disney Studios as a background painter. Again, he proved a quick study, lending his talents to the Academy Award-winning short Toot, Whistle, Plunk and Boom, beloved full-length feature Sleeping Beauty, and many other time-honored Disney animated films. After his tenure at Disney ended in 1958, Earle turned his attention to commercial animation and advertising, then returned ot fine art full-time in 1966. Here, in the last three decades of his life, Earle created an immense and impressively varied body of work. He became an expert at the silkscreen-printing process known as serigraphy, a painstaking art form that could require up to 200 individual screens. He also created dozens of graphic and arresting scratchboards—engravings carved into boards primed with white clay and black ink—for his autobiography, Horizon Bound on a Bicycle. In addition to his multimedia experiments, Earle painted dazzling oil works of the natural world, capturing the rolling hills, lacy and voluminous trees, and crashing blue waves of California in a nearly transcendental light. A moving and lyrical writer, he often accompanied his mesmerizing landscapes with equally meditative and intriguing poems. After a long and esteemed career, Earle passed away in 2000 in Carmel-y-the-Sea, California, leaving behind a formidable legacy in animation and fine art. Today, his work is in the permanent collections of several prominent museums (including the Metropolitan Museum of Art in New York), while his memory continues to inspire new generations of aspiring creatives around the globe.